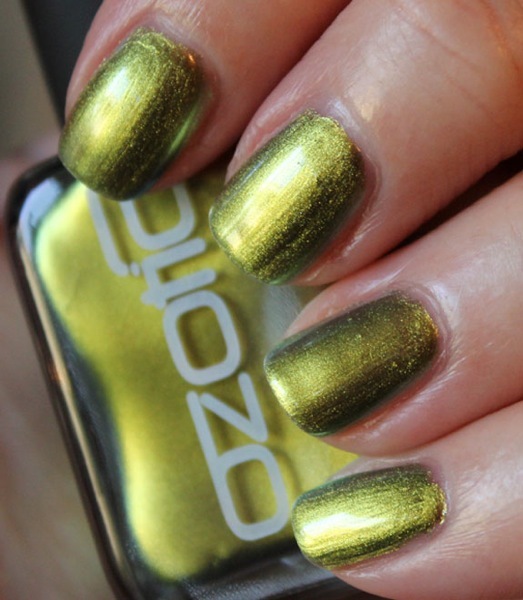 Ozotic 507 is a polish that every multi-chrome lover *must* have! I know what you’re thinking. You’re thinking do I really need this though? You’re thinking that you already have every multi-chrome you will ever want or need. You are thinking, well I already have Chanel Peridot and this is basically a dupe, right? Wrong! 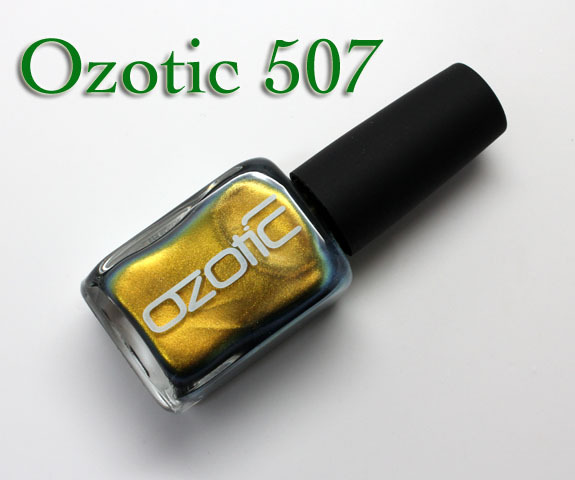 Ozotic 507 comes in the new more rectangular bottle, which I actually really like the shape of. It looks neat and orderly. The color changes from a heavy warm old gold to greenish-khaki to a bright green to a greenish-blue. The finish is a shimmery metallic and brush strokes are very minimal. I got excellent coverage with just two coats. Beautiful! Here you can really see how heavy a gold it is and the edges are slightly green. Now you see mostly just a bronze gold color. Here you can see without the flash how green it gets when you move your hand around. It’s VERY multi-chromatic, always changing never staying the same. It looks exactly on the hand as it does in the bottle, which is why I love it. You get what you expect from it! It is on the expensive side for sure, but I really do think this is one of the best multi-chrome colors I have ever seen. When comparing it to Chanel Peridot here are the differences I see. Peridot’s gold color is much less warm and not as heavy. It looks a lot cooler and less “old gold” colored. While I do get that green flash with Peridot, it’s much stronger here. Also with this one I see a blue-green color, which I don’t get with Peridot. Availability: Shopllarowe or Overall Beauty. Pricing: $17.50-18.00 for .5 oz. 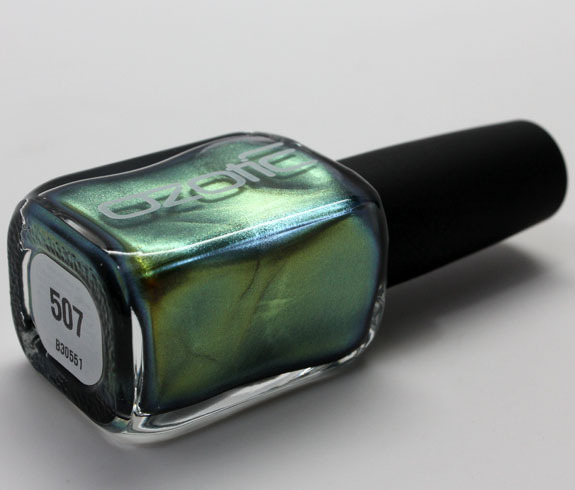 Soooooooo, do you think you may need Ozotic 507 in your nail wardrobe? This is what I expected Chanel Peridot to be. Obviously I like the Ozotic Pro best. When I saw the price, I winced. However, the color may be special enough for me to overcome the wincing! Ozotic Pro definitely has some of the best (if not THE best) multichromatic polishes out there! Pricey but oh so worth it. I wish I knew about this polish earlier, then I wouldn’t have gone crazy with Peridot. This comes out cheaper, too, ($18 vs $25) and with a better color shift to boot! I’ve really liked all the Ozotic Pro swatches I’ve seen, but they’re unfortunately cost prohibitive for me at the moment. Is this similar to Model’s Own Golden Green? WOW…so pretty! A little spendy, but it looks like you get what you pay for with this one. Thanks for your great review and, as always, beautiful swatches! Looks fun. Will you be showing comparison pics? Nice, I’d like to see this with a matte top coat. Matte top coats do really nice things to duo chrome-y polishes. The price is ouchy :/ but gah is it so cool looking. Oh STOP IT. LOOK at that. Okay, this one’s on my Llarowe shopping list for CERTAIN. Okay, no, I’m going to order it right now. Very pretty. It does resemble Peridot to my eyes. Okay, seriously- I should NOT be buying presents for myself. Perhaps I am needing this like life-saving medicine. Surely I can make an exception for THAT. DO IT. I just ordered it too. That is just straight-up irresistible. Oh WOW! This one I have to get, BUT I’ll wait till after Christmas. Have 3 G-kids to buy for. The first 2 pics where the gold is at its strongest – Wow. Wee. I felt like I needed shades. Still yet, I already have Peridot, which I looove. That is cool looking, but not really my kind of duochrome. I don’t care for the colors in this one. I’m more of a teal/blue/purple/red kinda girl. 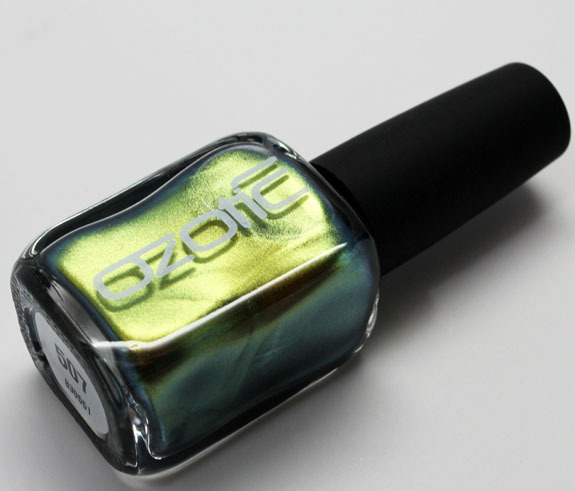 Ozotic polishes are awesome though. I just got 532 in the mail yesterday (wearing it now) and I have 5 more on the way soon. Ozotics are totally worth every penny! Ever since you showed Ozmotic I’ve been wanting them. This is gorgeous. I love how it changes. Trying to decide a mani–I think this is in the running! I just straight up slipped on a puddle of my own drool. I want this. As if that wasn’t clear enough. Having just now let this dry — I’m a green addict, and they had me at ‘green’ — it’s well worth every penny. Throw in the gold and the teal and I’m well and truly done for. 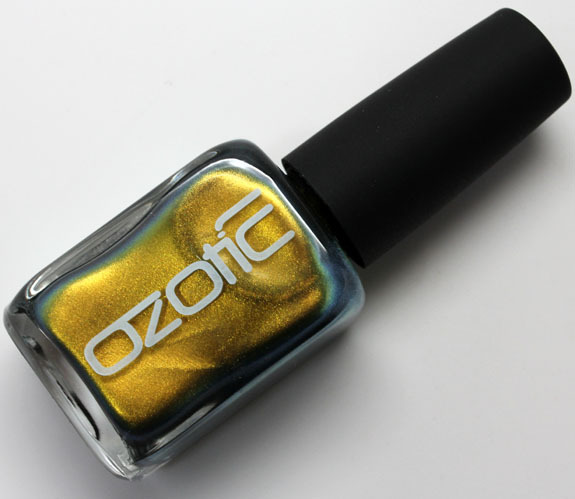 Ozotic seems to have multichromes down to a science; I’m hoping we’ll see a lot more of their range available in the US soon!